I recently discovered that Blender added some very significant modeling tools, including sculpting and multi-res mesh support (now at version 2.44). I have been following the development of Blender for some time now and am greatly impressed at its capabilities. I have seen some of what the latest and greatest of the big name 3D applications have to offer, and they are likely a few steps ahead in the game. However, Blender is quick on their heels, with incredible power to boot (ew, I hate that expression). Through the years, I have dabbled with a number of 3D programs, including Bryce (4,5,5.5), Poser 4, POVRay (way too technical! ), Ray Dream Studio, TrueSpace, Rhino 3D (demo) and others. Basically, I have tried anything I can get my hands on for free or relatively cheap. In general, the world of 3D software has long been impenetrable on a modest or low income (that is, unless you disregard software pirating laws - which I can't feel at east to do). Packages like 3D Studio MAX, Maya, SoftImage and Lightwave have price tags in the multi-thousands of dollars! Now Blender steps into the scene - absolutely free - and it boasts many of the powerhouse features that make those other names great in the industry. Not only that, but the source is open, meaning if you have considerable experience in programming, you can develop tools that rival any package - or at least save you time in the tasks you are accustomed to. Because of this open source concept, Blender is constantly being expanded by a world of talented programmers. Those changes that truly add considerable ease of use or tremendous functionality are added into the compiled package. Open source really is a great concept in that way. The new sculpting modeler offered by the latest Blender revision caught my eye. I recently updated to see how the sculpting felt. 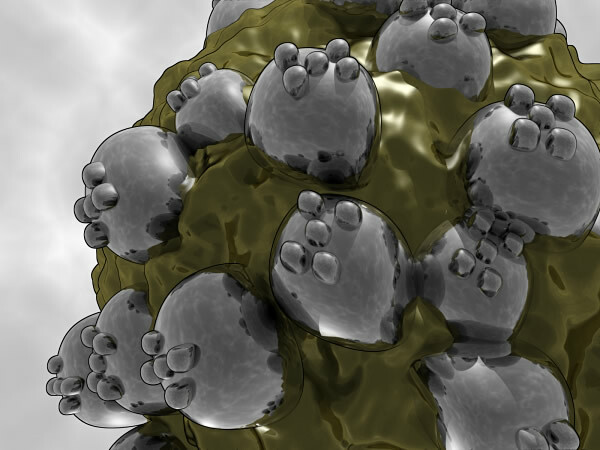 I have toyed with several modeling methods, including mesh, splines, nurbs and metaballs. Of them all, I find this new sculpting method far more intuitive and quick to get amazingly intricate and precise results. Not only that, but it requires perhaps the least amount of skill to turn vision into reality. With the sculpting tool, surface geometry is painted on (or off) using weighted brush tools. I have used weighted brush tools before, but they usually work by pulling vertices in relation to the viewport - which is absolutely stupid and of zero value! Blender's sculpting tool, on the other hand, pulls vertices in relation to the shape's center, perpendicular to the tangent of the surface. So, as the brush curves around a surface in 3D space, it works in relationship to the surface, not the camera/viewport. If you have a hard time visualizing technical verbage like this, you'll have to try it to appreciate it - it is a significant improvement! Don't forget, Blender is free... and impossibly small: the standard download is 8 Megabytes (WHAT!?! HOW!?!). You can find more information on exactly how I created this mostly useless image on EsoGallery.